Portugal has declared three days of national mourning after the most deadly forest fire in its recent history left at least 62 people dead. 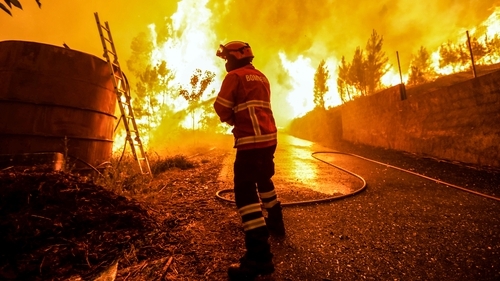 The blaze hit the mountainous area of Pedrogao Grande, 200km northheast of Lisbon, amid an intense heatwave and rainless thunderstorms. The death toll has gradually climbed from the 19 initially announced late last night. More than 50 people have been injured and taken to hospitals. Police said a lightning striking a tree probably caused the fire. Jorge Gomes, the secretary of state for internal affairs, has said most of the victims were caught in their vehicles on the road. Various local motorways were shut for safety reasons and hundreds of firefighters were still battling the flames this morning. "Unfortunately this seems to be the greatest tragedy we have seen in recent years in terms of forest fires," Prime Minister Antonio Costa said. "The priority now is to save those people who could still be in danger," he said at the Civil Protection headquarters near Lisbon. Portugal was sweltering under a severe heatwave yesterday, with temperatures exceeding 40C degrees in several regions. About 60 forest fires broke out across the country during the night, with around 1,700 firefighters battling to put them out. The flames spread "with great violence", moving out on four fronts, Mr Gomes said. "The smoke cloud is very low, which does not allow helicopters and fire planes to work efficiently ... but we're doing everything possible and impossible to put out this fire," he added. He said no villages were currently at risk. President Marcelo Rebelo de Sousa visited the site of the tragedy during the night and later expressed his condolences. He said it "was not possible to do more than what has been done" in prevention and the immediate response. Television footage showed hundreds of local residents being treated for smoke intoxication in emergency services tents set up in the area. Many who lost their homes were transferred to temporary shelters. The government sent two army battalions to help the emergency services in the Pedrogao Grande area and the EU said it would provide firefighting aircraft. France has offered three planes and Spain has sent two planes already. "All will be done to assist the authorities and people of Portugal at this time of need," the European Commission's aid chief, Christos Stylianides, said in a statement. French President Emmanuel Macron said in a message published on Twitter: "Solidarity with Portugal, hit by terrible fires. Our thoughts are with victims. France makes its aid available to Portugal". Commission President Jean-Claude Juncker said in a message in Portuguese, published on Twitter, that his thoughts were with the victims and praised firefighters for their bravery.